This photo is of my friend Ken Kruger running an 8′ drop in a rapid known as “Terminator”. This photo shows about 1/100 of the rapid. Terminator’s HUGE, and aptly named. We were running a whitewater rafting trip down the Futaleufu River, and the water level was high. While all the guests walked the rapid, and we ghosted the boats down the river, the kayakers paddled it. I got into position below this drop, and was lucky to get Ken with his mullet flying (well, actually Ken likes to call his hairdo a ponytail, he thinks ‘mullet’ is somehow demeaning) as he boofed off the top, and made a really sweet line down the middle of this drop. Super nice run, Ken. Ken’s a super nice paddler. He always looks this smooth in the water. It was interesting to me to shoot the same paddlers for so long, and see their individual styles. As a whitewater kayaker, Ken always had a great line. I saw him get worked one time. Not bad for 2 months of solid kayaking on one of the top whitewater kayaking rivers in the world! Ken’s also a guitarist/singer – another reason to call him a friend! He has his own website where you can check out his latest recording, upcoming gigs, even his musings on whatever strikes his fancy. Check out Ken Kruger. I spent 4 months in Futaleufu, Chile, and worked with some simply awesome people. It was a great adventure and a great trip. The time spent on the river was fantastic. The Futaleufu River offers some of the best whitewater paddling (kayaking and rafting) anywhere – the most frequently run section is called ‘bridge to bridge’ (in Spanish that’s ‘puente a puente’) and is a nearly continuous string of Class 3+, Class 4 and 4 rapids. There are several Class 5 rapids on the river, both below and above the Bridge to Bridge section. Terminator was probably my favorite, the grandeur of the rapid set it apart. I’ll try to post a wider shot soon showing how big the rapid is. Only the very best kayakers run this rapid, and rafting is only advisable if the water level is mid-low, and the crew is super solid. Many times guests will walk this rapid, because the water’s too high, or because they’re not solid enough paddlers. 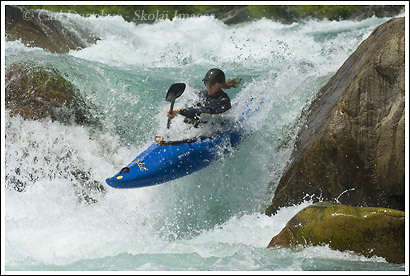 This entry was posted in Adventures, Chile, Kayaking, People on April 26, 2007 by Carl D.